SITIO is pleased to announce the Hubbard-Vernor project has been unanimously approved by the Detroit Historic District Commission and the Board of Zoning Appeals! Working in collaboration with Cinnaire, Southwest Business District Association, and Invest Detroit, SITIO has recently completed schematic design on the 53-unit affordable housing mixed-use development in the historic Mexicantown neighborhood of Southwest Detroit. Located a mile from the former Michigan Central Station and soon to be home of the highly anticipated Ford Innovation Center, the project brings density and urban vitality to the Vernor-Bagley commercial corridor through diverse housing options, low-rent retail space for local business, enriching community amenities, and landscaped public space. Identified as a site for strategic catalytic development, the project has undergone significant community participation and will set precedent for equitable growth in the region. In keeping with the context of the Hubbard Farms Historic District and the Bagley-Vernon Traditional Main Street guidelines, the project integrates contemporary design that thoughtfully responds to the local vernacular. Working with the challenges of a constrained site footprint, the project’s massing is articulated to create an inviting pedestrian-scaled street frontage that enhances the continuity of active facades along Vernor Highway. With two major project milestones underway, the project is moving full speed ahead with anticipated completion in the Spring of 2021. The Bridesburg Park recently received a William Penn Foundation grant which will help launch Phase 1 of construction as featured in a recent Philadelphia Inquirer article. SITIO has completed design and documentation of the architectural components of this 10-acre riverfront park that includes a performance pavilion, picnic pavilion, and restroom facilities. These structures evoke the site’s existing industrial context and celebrates the iconic Betsy Ross Bridge that can be seen from nearly every corner of the site. The Bridesburg Park serves as a keystone in connecting the community of Bridesburg not only with their waterfront, but also their industrial heritage. The project team includes Langan, Ground Reconsidered, O’Donnell and Naccarato, Arora Engineering, Milrose Consultants, and Becker & Frondorf. SITIO’s Jason Jiang, volunteer Director of Fun and Games at ACE Mentor Program of Eastern Pennsylvania, continued his support as a referee in the 3rd Annual Giant Jenga Competition for the ACE Mentoring Group. This year the competition had 48 teams and over 300+ participants, and raised over $20,000 in scholarships for high school students. Once a mentee and now a mentor, Jason credits the ACE program for helping him cultivate his passion for architecture as a local high school student. He thanks the design community for their continued support and donations for this program that exposes architecture, construction and engineering to underrepresented groups. SITIO welcomes Andrew Chaveas to the team! Andrew is also an ardent supporter of the sharing economy having volunteered at the Station North Tool Library in Baltimore - reach out to borrow anything - or just to talk about tools! Construction has begun on 3720 Chestnut! 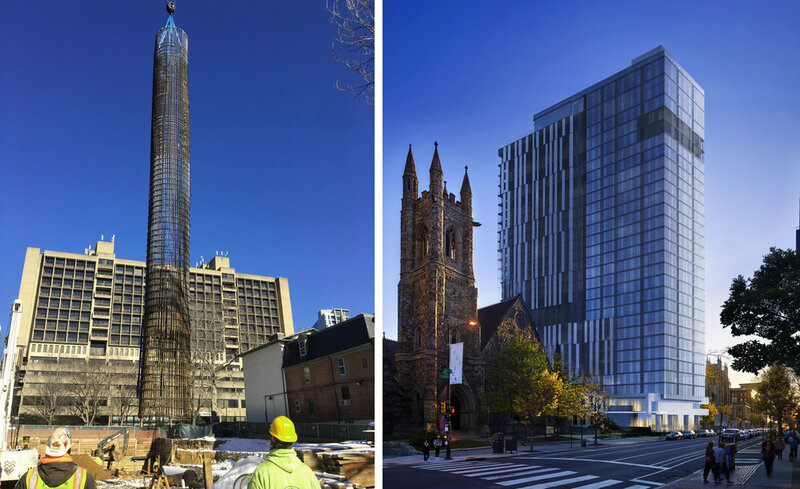 Our 30-story multifamily residential project in University City is being developed by EPG Urban and Mapletree Investments. The project is being built by the Hunter Roberts Construction Group, and will be completed in mid 2021. 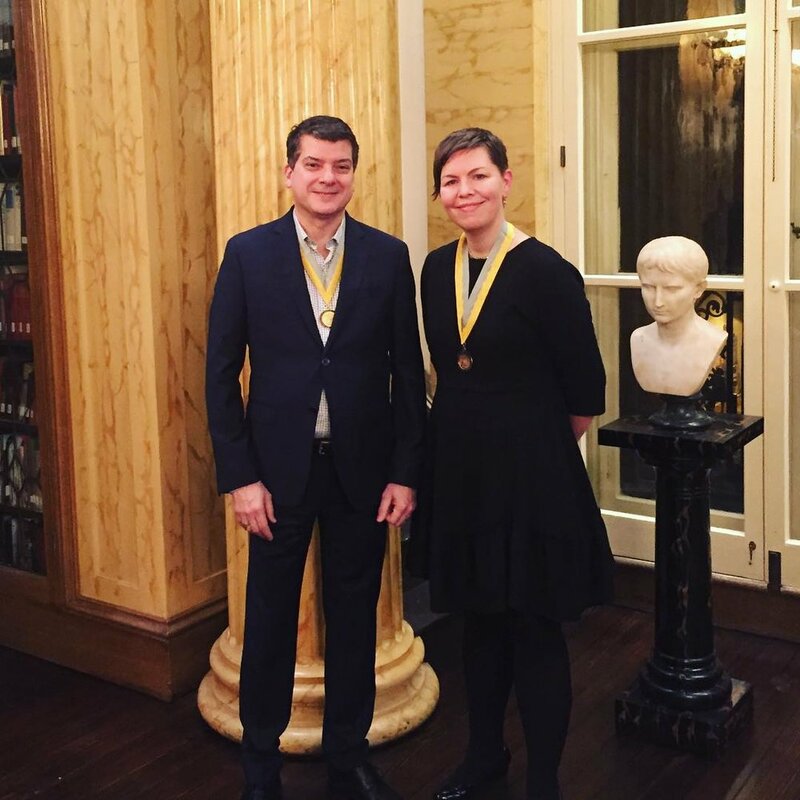 Congratulations to SITIO principal Karen Blanchard who ends her 2018 term as Philadelphia AIA President and joins SITIO founding principal Antonio Fiol-Silva as distinguished past-president alumni! SITIO’s Andrew Ferrarelli presents to a group of middle school students at Welsh Elementary in Philadelphia, PA as part of Compete 360's Designers in Schools week. For several years Andrew has volunteered as a mentor at various schools helping students creatively solve problems they identify in their school or community. The program empowers students to become change makers while learning about design thinking. Compete 360 is an organization to support the education and development of urban youth. For fourteen years, the charity provided academic support and enrichment programming to children in grades K-8 in Atlantic City, Camden, and Philadelphia. Their mission is to cultivate a design thinking practice in under-resourced city schools, helping teachers bring new ideas and practices to their work, and helping students engage in hands-on, inquiry-driven learning. Dozie Ibeh, Associate Vice President of the Project Delivery Group at Temple University. Anne Krakow, Director of the Post Learning Commons and Drexel Library at Saint Joseph’s University.